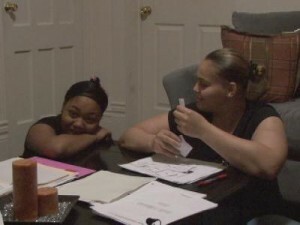 Latino students in the Syracuse City School District practice vocabulary with flash cards. The language barriers between them and the teachers make it difficult for them to succeed. This fall, Latino community leaders from Syracuse, Rochester and Buffalo met at the Upstate Latino Summit. The summit– held in downtown Syracuse– gave Latinos from all over Upstate New York the opportunity to discuss issues in their community, such as education. Nationwide, Latinos have the highest drop-out rate. And according the latest statistics revealed on the New York State Report card, Syracuse City School District is following that trend– a concern for some local leaders. ” We all know that, based on demographics, if we do not change that drop-out rate… this country is not going to survive,” said Syracuse Common Council President Bea Gonzalez. During the education workshop, Margarita Reyes, a representative of the Rochester City School District showcased a survey she conducted at Monroe High School in Rochester. She asked the Latino students why their peers failed to finish school. Reyes said work, absence of parental guidance, pregnancies and lack of support from faculty were the main reasons why students said their peers quit school. And some of the students in Syracuse shared similar sentiments. “There’s a lot of percent of them that drop out because they get picked on,” said April Keller, a student at Fowler High school. Social worker Donna Lucente has assisted students at Syracuse’s Fowler High School for more than a decade. She said a lack of vision is the reason students quit school. “A lot of students don’t have a vision for their future that they could go to college or that college could be affordable for them,” Lucente said. The Syracuse City School District has around 20,000 students enrolled in school this year. About 1200 of them are Latinos. Fowler High School has the largest percentage of Latinos out of all of the high schools. There, Latinos make up about a quarter of the student body. According to the New York State Report card, which gives statistics and evaluates the performances of schools in the state, only 32 percent of the Latino students at Fowler High School in the class of 2007 graduated by August of that year. That’s about 22 Latino students out of the 68 students in the class. Principal James Palumbo said the school’s dropout rate is “unacceptable.” He states the school’s six-year Latino graduation rate is somewhere around 50 percent. And he said he is willing to bet that if he had more Spanish speaking teachers, the graduation rate for Latino students would rise. But, year after year, Palumbo said there aren’t any Spanish speaking certified candidates applying. Syracuse City School Superintendent Lowengard echoed Palumbo’s concern. **If you want to learn more about how your child’s school scored on the New York State Report card, click here.